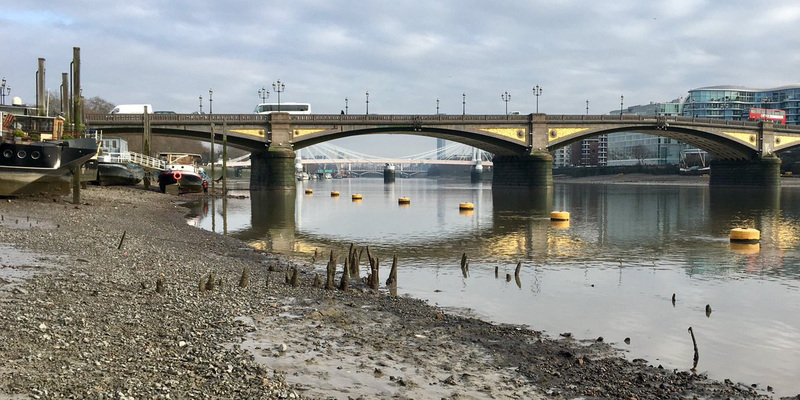 Since I joined the Thames Discovery Programme I’ve been taking every opportunity I can to get onto the Thames Foreshore to ‘get my eye in’ and build up my knowledge of the foreshore, its features and finds. On 25 January 2019, Nathalie Cohen (one of the founders of TDP) showed Josh Frost and I round the foreshore at Chelsea. We descended the steps near the houseboats there and checked over a set of post-mediaeval posts before looking at the splendid Anglo-Saxon Fish trap. It was an unusually low tide so plenty of timbers were showing and it was easy to see that the southern side ran more-or-less straight while the landward side was angled in to funnel the fish into a narrow run where nets or baskets would trap them. We discussed the possibility that the area was not tidal at the time it was in use and that the Anglo-Saxon fishermen had constructed the structure in the river. I found this added to the degree of admiration I felt for the work involved. We looked up and down the foreshore as the tide continued to ebb, we spotted some 19th and 20th century pottery and more modern plastic detritus, there was also some animal bone which I examined to gain some idea of what species were present. Then I spotted something unusual with a hole in it. I picked it up for a closer look, and found myself holding what looked to my eyes like a piece of red deer antler with a hole drilled through it from one side to the other. Nathalie suggested that the object I’d found might be an antler mattock. We photographed the antler in situ and bagged it to take back to the office. It is 253 mm in length and averages about 37 mm in (intact) diameter and the hole through it is about 17mm in diameter. Alan Pipe, zooarchaeologist with MOLA identified it as a red deer antler. 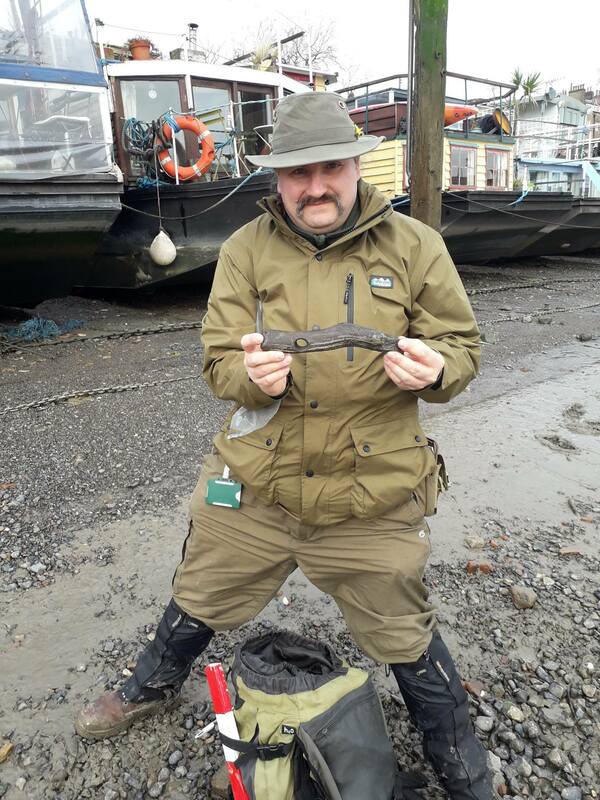 Stuart Wyatt, the Finds Liaison Officer for London has examined it, it will be recorded on with the Portable Antiquities Scheme and accessioned by the Museum of London. We shared the antler on our social media where it has generated a great deal of interest. Over 26,000 people have seen the photos on Facebook! I should probably explain at this point that I’m not a complete stranger to antler. Having done re-enactment and living history focusing on the Iron Age and Romano-British eras, I’d seen reproduction antler artefacts and had even tried making things myself including toggles, knife and tool handles, a ring and some needles. I’d seen a similar object described in a book as an arrow straightener, but I wasn’t familiar with the use of antler to make a mattock. One of my first thoughts was how I might go about making a hole through a piece of antler with prehistoric technology, particularly with pre-metal technology. I decided that I’d begin by selecting a fairly straight rounded edge piece of coarse stone, sandstone or millstone grit which I could use to wear a rounded groove at right angles to the length of the antler. Having worn a shallow groove, which would help to prevent slippage, I’d then prepare a round piece of wood about 1.6mm thick, carved with a blunt or obtuse point. I’d use this, after the manner of a bow drill, to grind sand into the groove thus creating a hole through it. 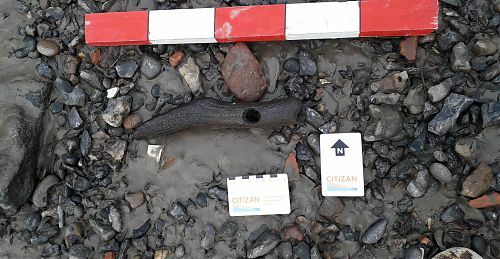 My initial reading of research by Benjamin Elliot into prehistoric antler artefacts in Britain, suggests that this is a type D antler mattock (or axe), likely falls within the date range of 8400-2600 BC, straddling the Mesolithic and Neolithic eras. Many of the other examples antler mattocks from the Thames are antiquarian finds from the 19th century, and it’s unclear where they were discovered. 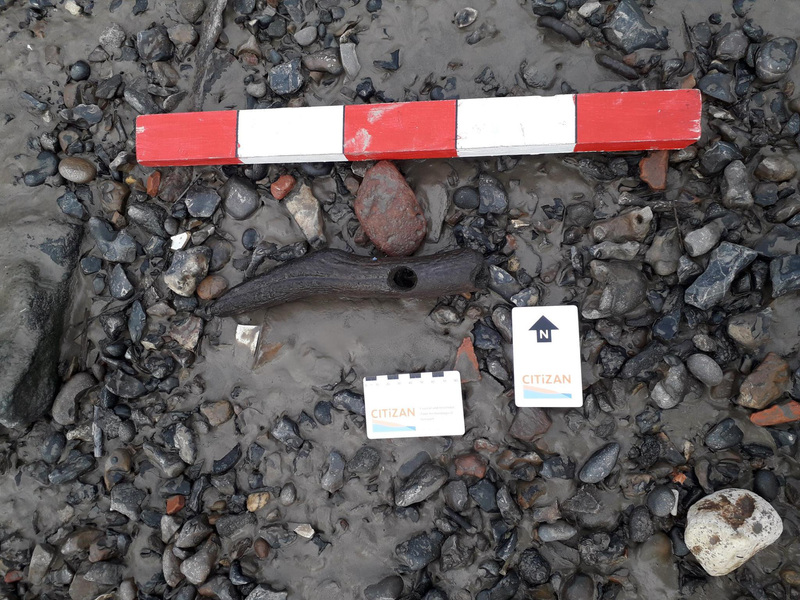 This mattock, with a known findspot, will help add to our understanding of the prehistoric Thames. I hope that in the future, funding might be available to radiocarbon date the antler and that microscopic analysis may provide clues to the usage of these mysterious objects from our distant past.